Book Free Stays at Hyatt Hotels by Transferring Chase Points in 4 Easy Steps! I recently shared 6 reasons why Hyatt is my favorite Chase hotel transfer partner. Booking award nights at Hyatt hotels can get you incredible value when using your Chase Ultimate Rewards points. And Emily and I have had wonderful experiences at many of their hotels, including the Hyatt Regency Maui and Park Hyatt Paris-Vendome. The best part is it’s incredibly easy to transfer Chase Ultimate Rewards points directly to your Hyatt account and book a free stay! In just 4 easy steps you can transfer points and book an award stay. I’ll show you how! Link: 6 Reasons Why Hyatt Is My Favorite Chase Hotel Transfer Partner! If you also have a no annual fee card like the Chase Freedom, Chase Freedom Unlimited, and Ink Business Cash Credit Card, you can move points to an eligible Chase Ultimate Rewards account that allows you to transfer them directly to Hyatt at a 1:1 ratio. 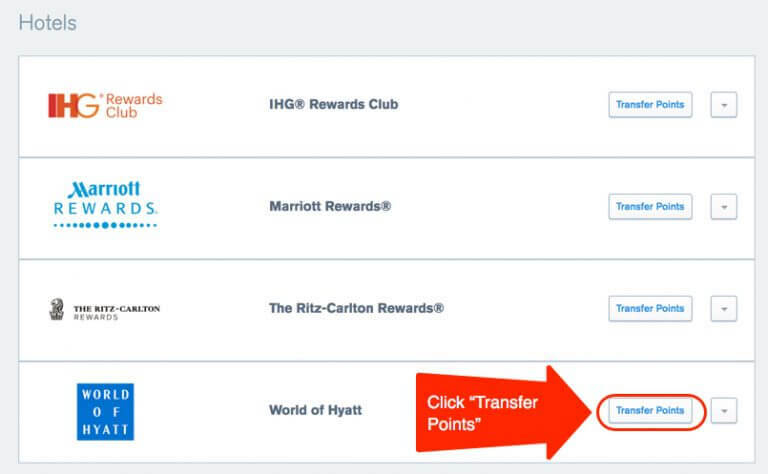 Once you’re ready to transfer points, use this step-by-step guide to get them into your Hyatt loyalty account! Hyatt has a no “blackout date” policy. But a standard room must be available in order for you to use points to book an award stay. So before you transfer points to your loyalty account, its a good idea to confirm award nights are available. Because once you transfer Chase Ultimate Rewards points to Hyatt, you can NOT transfer them back. 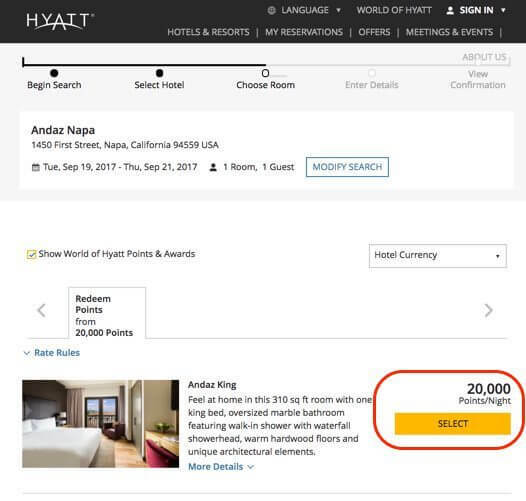 In my sample search at the Andaz Napa, it shows award nights are available for 20,000 Hyatt points per night. This makes sense because it’s a Category 5 hotel. Now You Know How Many Points to Transfer to Your Loyalty Account! If it looks like award rooms aren’t available, there’s still hope! As long as you see a standard room available to book with cash, you can call Hyatt at 800-228-3360 to see if you can book using points. And keep in mind, you can NOT book award stays at Hyatt’s all-inclusive hotels online. You must call Hyatt to book a room at an all-inclusive like the Hyatt Ziva Los Cabos. Although it’s an extra step, it’s worth it to save money on a fantastic stay! 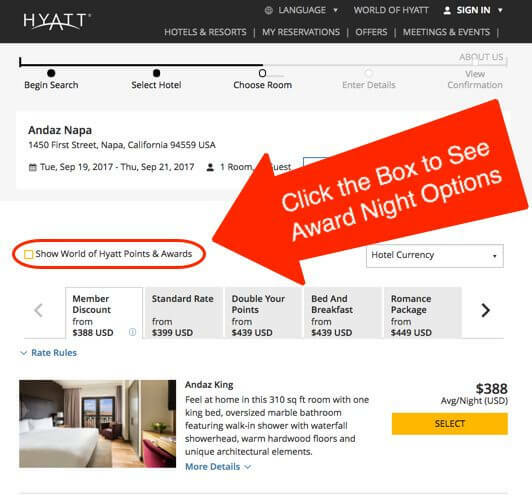 With all-inclusive hotels, I recommend you call Hyatt to confirm there are available award nights before transferring Chase Ultimate Rewards points to your loyalty account. This way you can avoid the frustration of moving your points and finding out there are no rooms available. 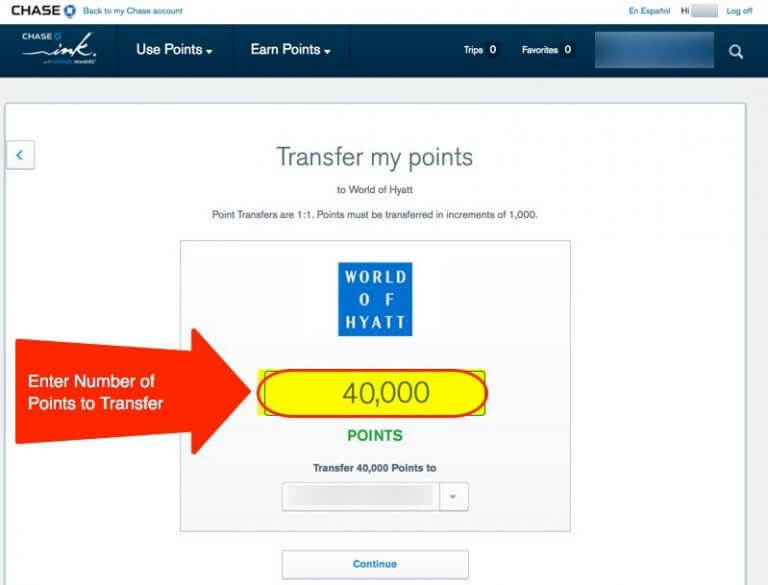 Now that you know how many points you’ll have to transfer, log into your Chase Ultimate Rewards account and link your Hyatt account. On this page, enter your Hyatt loyalty account number. Once your Hyatt account is linked, the information will automatically save to your Chase Ultimate Rewards account. This means you can instantly transfer points in the future. It’s time to move your points to Hyatt! Just enter the number of points you’d like to transfer to your loyalty account. You must transfer your points in 1,000-point increments. Remember, once you move points you can NOT move them back. So double check to confirm you’re moving the right amount of points. Chase Ultimate Rewards points typically transfer instantly to your Hyatt loyalty account. So once you complete your points transfer, log-in to Hyatt and book your award stay. 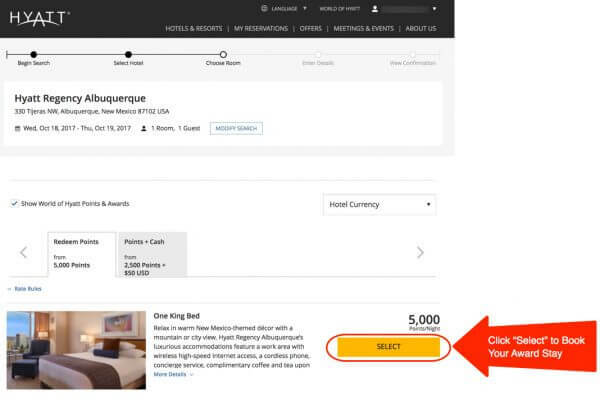 Similar to Step 1, find the hotel you want to book and enter your travel dates. When you see the cost of the award night and room type, click “Select” to book. Then, enter the required information to finalize your reservation. Remember to check the hotel’s cancellation policy when booking. If you have to cancel within the eligible timeframe, you’ll get the points back into your account. That’s it! Enjoy your free Hyatt award stay! You can earn Chase Ultimate Rewards points to use for free Hyatt stays with lots of great credit cards. I’ll share 3 options! Just keep in mind these cards are impacted by Chase’s stricter application rules. So if you’ve opened 5+ cards from any bank (except these business cards) in the past 24 months, it’s unlikely you’ll be approved. You can earn 80,000 Chase Ultimate Rewards points with the Ink Business Preferred card after you spend $5,000 on purchases in the first 3 months from account opening. This is the highest sign-up bonus currently available on any card earning Chase Ultimate Rewards points. This card has a $95 annual fee, which is NOT waived the first year. When you open the Chase Sapphire Preferred card, you’ll earn 50,000 Chase Ultimate Rewards points after you spend $4,000 on purchases in the first 3 months from account opening. The annual fee is $0 for the first year, then $95. This makes it easy to evaluate the card for ~10 months without a fee to see how you like it! You’ll earn 50,000 Chase Ultimate Rewards points after spending $4,000 on purchases in the first 3 months of opening a Chase Sapphire Reserve account. This card has a $450 annual fee, which is NOT waived the first year. But cardholders get amazing perks like up to a $300 statement credit each account anniversary year, which offsets travel purchases for hotels, airfare, car rentals, and much more! It only takes a few minutes to transfer Chase Ultimate Rewards points to Hyatt and book an award stay. Before you transfer points, I recommend checking the cost of your award stay and seeing if rooms are available with points. 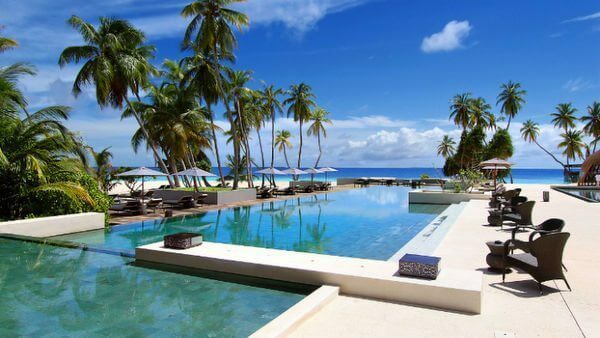 Because once you transfer Chase Ultimate Rewards points to Hyatt, you can NOT get them back! Don’t forget you’ll have to call Hyatt at 800-228-3360 to redeem points at all-inclusive hotels like the Hyatt Ziva Los Cabos. To earn Chase Ultimate Rewards points for free Hyatt hotel stays, you can consider cards like the Ink Business Preferred, Sapphire Preferred, and Chase Sapphire Reserve! Can I use my UR points to pay for Hyatt hotel nights? Do I need to have Hyatt Status also? If able to book Hyatt rooms and pay with U.R points, how do I do that, please? 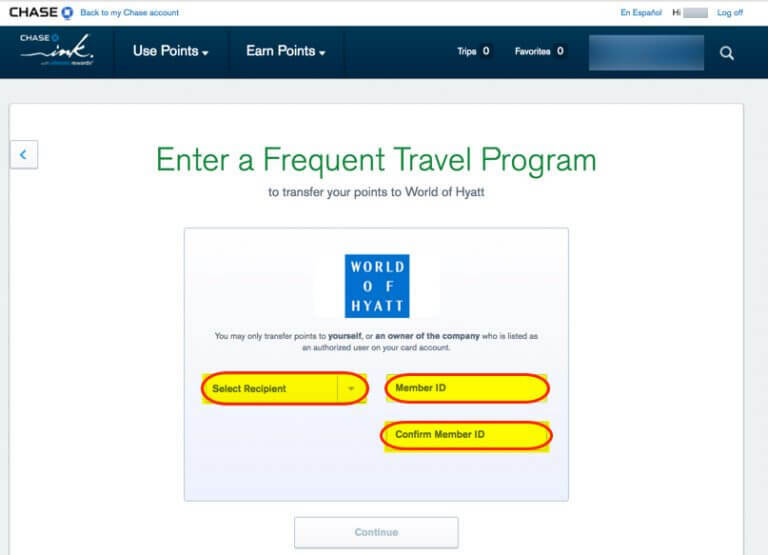 You can transfer Chase Ultimate Rewards points to your Hyatt loyalty account and book an award night following the step-by-step guide in this post. You don’t need Hyatt status to do this. What’s your experience with upgrading award stays with points or cash @Hyatt properties? You must call Hyatt at 800-544-9288 to upgrade with points. Sometimes you’ll see an option to use more points for an upgraded room at the time of your award booking. I just checked Chase’s website, and right now, you can get the Hyatt Zika Los Cabos for 14,534 points (with the Reserve point value). Why would I transfer 20,000 Chase points to Hyatt for the same hotel? For status extras? Is there a resort fee that gets waived if booked thru Hyatt? On face value, it looks like I could get 5 nights thru Chase for the point value of 4 nights if I transfer them and book thru Hyatt. Excellent point! Depending on your travel dates, it’s possible you might use fewer points by booking through the Chase travel portal. If that’s the case, I’d definitely book that way! During my search, I found most nights cost $300+, so it would make more sense to transfer points to Hyatt to book as an award stay.